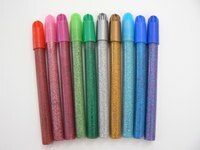 Glitter glue is a common supply for crafts and comes in several colors to match any taste. Glitter glue is much easier to use than standard glue and loose glitter because the glue and the glitter are already combined together, making it less messy and easier to control. Embellish any craft project with glitter glue. One of the most common uses of glitter glue is for scrapbook projects. A scrapbook is a book loaded with photos and mementos from family events, such as vacations or the addition of a new baby. Each page is unique, with different pictures and layout. The background for the photos is typically plain or patterned cardstock. These materials can be found at your local craft store. Glitter glue is an added accessory that can be used to dress up pages even more. Use the glue to create a glitter border around photos or the edge of the page. Also use glitter glue to outline letters or other embellishments on the page, such as charms or stickers. Glitter glue can also be used with rubber stamps to make elaborate card designs. When using glitter glue with stamps, work quickly so the glue doesn't dry before you are done. The first step is to choose your card and stamp. Use plain or pattered cardstock found at the craft store. Simply paint a light coating of glitter glue on the stamp very quickly and be sure to get all the major outlines. After the stamp is covered with glue on all the outlines, stamp your card. Let your design dry for a few minutes while you run hot water on the stamp to wash off the glue. Practice on a piece of plain paper first if you like. This technique works best with stamps that have simple outlines. Use glitter glue to dress up plain wood frames; it works on most other types of frames, as well. This will work well in a child's bedroom with a specific color theme. If your daughter's room is pink and purple, select several shades of pink and purple glitter glue along with some basic wood frames. Lay out a tablecloth and find a suitable work area. Dab several dots of glitter glue on the frame and add more if needed. Paint the glue with a paint brush so that it blends in with the grain of the wood. Mix several shades of pink and purple for a distinguished look. Enhance clothing or hair accessories with glitter glue. To turn an ordinary headband into an extraordinary hair piece, dot several polka dots of your favorite shade of glitter glue on the headband. Blend the glue with a paintbrush for an all-over glitter look. Shoes and other clothing items can also look stylish with glitter glue embellishments. Dress up your little girl's plain pink shoes with some blue or red glitter glue on the edges. Use glitter glue to write your child's name on her shirt or socks.